<--- Here's my prototype aran ornament. It's definitely not as elegant as I had imagined it; I may take the blue out and replace it with a yarn that has some gold metallic in it. I was hoping to make all these ornaments from my stash without having to buy anything, but all I can think of is how perfect Nashua Grand Opera would look if I went out and bought some of that. Today is the perfect day to sit around and knit because a cold front came through this week, plus all the great/bad horror movies are on tv. I'm going to open all the windows and let the cold air in, and bundle up with my new giganto-hat, the wool socks that I've never actually gotten to wear, and my hideously-ugly-yet-soft rainbow blanket. That's the thing about Texas, you never get to wear your warm knitted garments. The number of cold days is usually less than the number of scarves, socks, and hats you have, so I am very selective about which ones I allow to be worn each year. Maybe I should buy a tent. What better way to make use of my FO collection than to live in my own back yard all winter? All of a sudden, there shined a shiny demon in the middle of the road. And he said "Knit the best hat in the world or I'll eat your soul." So I knitted the first thing that came to my head. Just so happened to be the best hat in the world. Hi, welcome to stash busters. 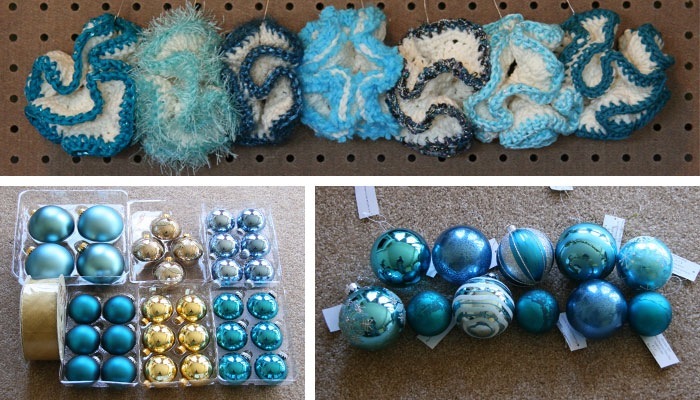 Upon careful review of my stash, it was decided that blue would be the best color scheme for the tree. I crocheted more of the little "hyperbolic" orbs last night, and I will be combining them with classic aran style cable patterned spheres. 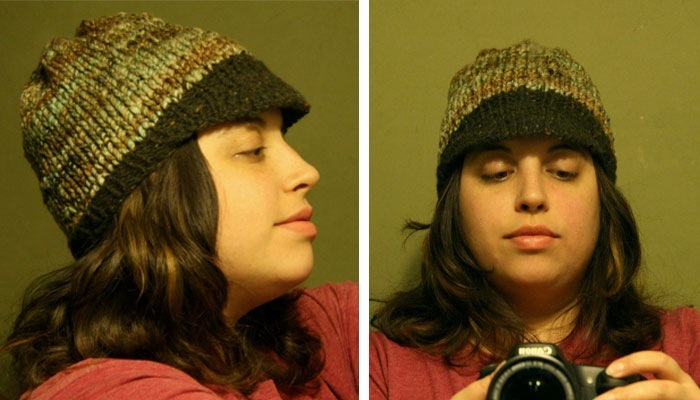 I knitted and unknitted about 5 testers, all of which were pretty crummy looking. At least now I know what I don't want. 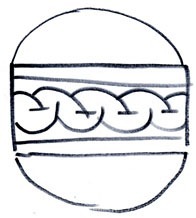 I think I have settled on a basic style for the aran ornaments: a strip of about 15 stitches or so containing the cable pattern, grafted into a seamless tube and oriented horizontally, then I will pick up stitches along each edge and decrease down to a closure, sort of like the drawing at left. 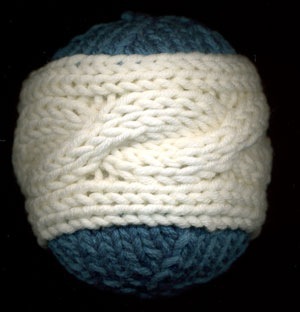 I will knit it tightly out of the same undyed wool that was used as the center of the other ornaments. Last night I asked if Adam would let me put up a Halloween tree, but he didn't fall for it, so the new Xmas tree is still sitting in its box mocking me. "Nyeah nyeah! You can't put me up yet, even though today is the coldest day of the year so far!" While organizing my junk craft room, I came across these early attempts at ornament making and I became inspired all over again. 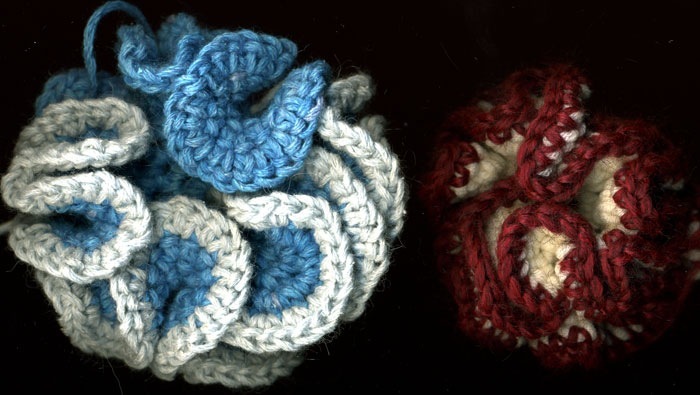 They're just some crochet squiggles where you start in a small circle and increase every stitch until they turn into ruffles. Later today I will probably play around with some other patterns too. I volunteered to have Christmas dinner at our place, since this is our first year back home. We bought a fake Christmas tree yesterday and I am DYING to set it up, even though it isn't even Halloween yet. Adam pointed out how silly it would be to have a tree up in October, but I may have to overrule him soon. After all, I need a tree to model my ornament designs, don't I? Apparently I took this week off. I didn't really mean to, but I looked up and suddenly 8 days had gone by and I had accomplished nothing. Whoops. I get some hilarious "bots" trying to sign up for my emailing list. First of all, do they think I won't notice that my usual 1 or 2 signer-uppers per week suddenly jumps to 200 within the span of 5 minutes? And I get 200 notifications saying that asdfasdfasdf@sdfafsd .com and hjklhjkl@hjkhk .com have joined my list? They're not even trying to sound like real addresses anymore. 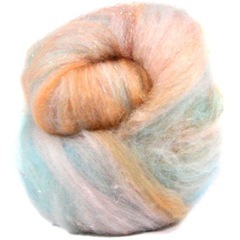 Secondly, why would a bot/spammer want to know when I have new handspun yarn for sale? What could they possibly do with that information? Let's imagine that I was brain-dead one day and actually put one of them in my address book. Then they'd get... notification that I was having a sale? A coupon code? What? I'm flattered that they picked li'l ol' me to be the target of their evil plot, but I really have to wonder what they expect to accomplish. Even lowlife spammers must have SOME kind of payoff in mind or they wouldn't be wasting their time, right? Lately there have been an unusually high number of aborted sales showing up in my log and I can't figure out why. They put things in their cart and click checkout, but something gets canceled somewhere along the way. I "bought" something from myself just to make sure there were no bugs along that way but everything was fine. Maybe people just don't want to sign up for a Google Checkout account, hopefully it's not that they're having second thoughts about my merchandise. I've been so badly screwed over by Paypal that they're not an option, so there's not much left for me to choose from. Boo!! Google checkout isn't that bad, you guys! I promise! Not much spinning this week because my back is very uncomfortable in my spinning chair, but I was able to get quite a bit of knitting done from my spot on the couch. I'm slowly but surely making progress on my Cable & Diamond Lace Socks, and I got through the most difficult section (argyle) of our Xmas stockings. The cable socks don't look this shabby in real life, I promise. Because of the black-on-black, I had to lighten the picture to the point that it looks washed out. I feel guilty about the stockings, because I kinda sorta stole the idea from a book that I did not purchase. ("A good artist borrows; a great artist steals.") I just couldn't bring myself to pay $30 for a book when I could take one look at the project and recreate it on my own, not to mention the fact that the book didn't have any other patterns that I would ever want to knit. I have justified my actions by emphasizing the fact that christmas stockings have existed for many years, and probably hundreds of them looked almost exactly like this one. So I'm not stealing from this one particular author; I'm stealing from a long line of pattern designers who each in turn stole from designers before them. The blame is easier to accept when I get to share it with so many others. 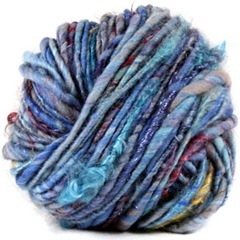 Imagine my surprise and delight when I saw that Opal yarns has come out with a line of Harry Potter sock yarns! Imagine my disappointment and dismay when I realized that they were just regular sock yarns with a Harry Potter label on them. 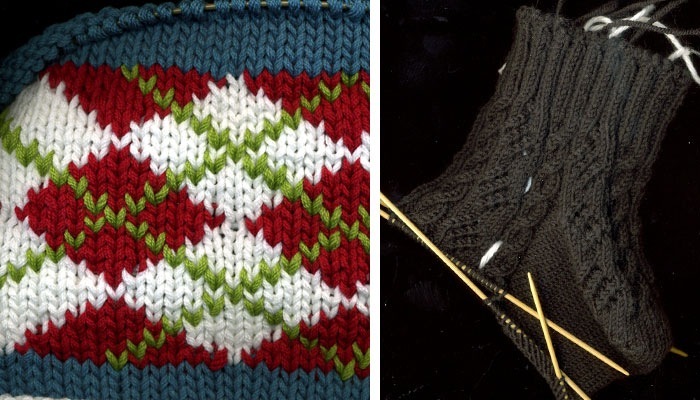 The colorway shown to the left is called "Lupin". Really? I don't see anything particularly Lupiny about it. In fact, it looks like a sunrise, which is the exact opposite of what you'd think of when thinking of a werewolf. The "Harry" colorway is just some blue stripes, "Tonks" is just some pink stripes, you get the idea. The only one they happened to get right was 'Ron" (orange and brown stripes) but only because it looks like some of the outfits he's worn in the movies. The "Hedwig" colorway is probably the furthest fetched. Despite being pretty, there's not a hint of snowy white to be found. For some reason they chose browns and greys instead. I know that Hogwarts house colors is kind of an overdone theme at this point, but would it have KILLED Opal to give us a burgundy and gold stripe? Or anything not made up from thin air, like Snitch-gold? Dumbledore's-flamboyantly-cut suit-purple? Snape's-underpants-gray? What a rip off. Blissful knitting, reading, and ranting. Debbie Bliss magazine's premier issue is a highly recommended read, in my opinion. It has a very Martha Stewart Living kind of feel to it. I am a finicky reader and have never subscribed to a knitting magazine before due to the inconsistency of pattern quality from issue to issue, but I might just have to subscribe to this one on faith. Debbie Bliss is a truly great designer and I trust that this great issue will be the first of many, not just a fluke. In addition to her designs, I have a soft spot in my heart for her yarns. 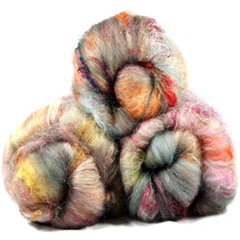 I've been a fan of the Cashmerino line for years, and now it seems no matter what I'm going to knit, Rialto comes to mind as a contender. This magazine will be like a high-class version of whatever that other magazine is that only calls for Lion Brand. Or that other other magazine that only calls for Red Heart. Bleagh. The selection of patterns in the issue is impressive. Though many of them have been published previously in her books, there are several new designs as well. I've already made it past the heel flap on the black cabled socks (knit in Rialto 4 ply) and I'm happy with them so far despite finding a couple of minor mistakes in the instructions. 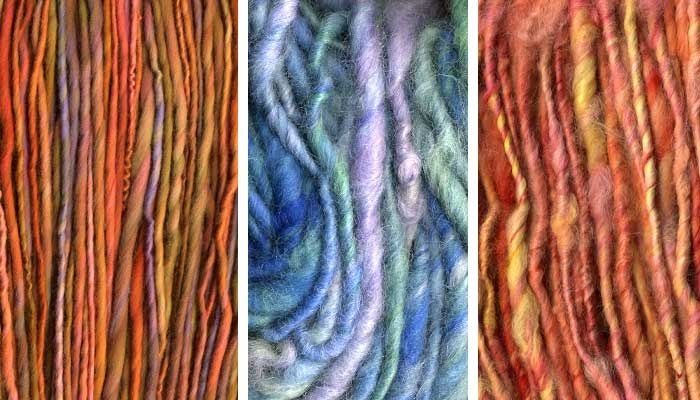 Rant Of The Day: I vowed to keep myself up to date with the latest knitting news, so I have tons of knitting blogs dump their content into my RSS reader. Lately I am really surprised at how many blogs previously consisting only of craft-related subject matter have begun adding political content to their posts. I'm just as opinionated about the presidential candidates as the next person, but a blog about knitting hardly seems like the appropriate place to discuss it. Why would you risk alienating your readers like that? 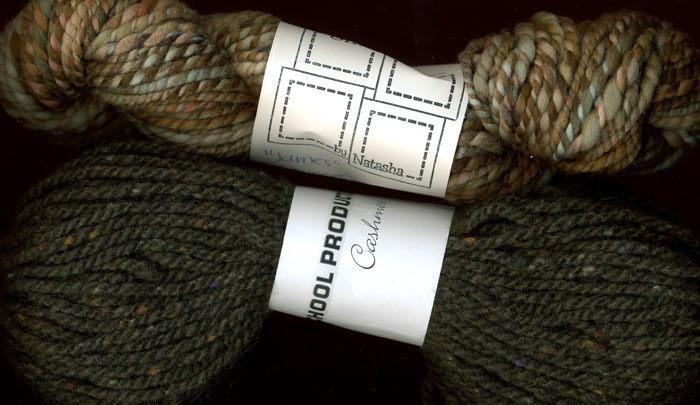 Rest assured, this blog will stay on the topic of knitting, though I many occasionally veer to such off-the-wall topics as crochet and spinning. It's not that I am against political blog rants. For instance, I've enjoyed reading The Little Red Blog of Revolutionary Knitting since seeing some of her machine-knit sweater art in a magazine. But her artwork is political in nature, and therefore the ranting is to be expected. 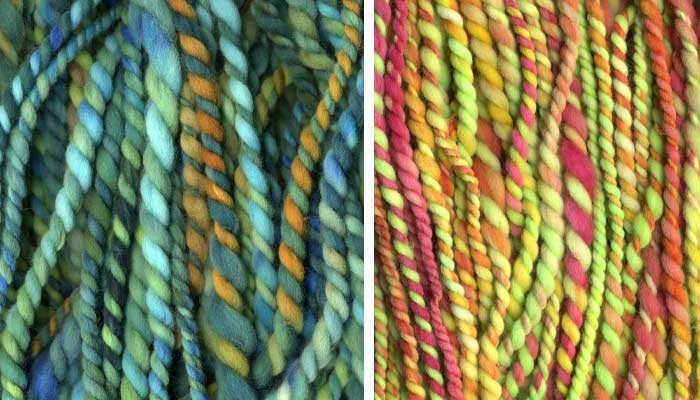 But one other blog in particular (whose name I will withhold to avoid being a meanie) had a post the other day where the writer went back and forth between posting pictures of progress on a scarf and discussing what a whacked-out moron Candidate x is and why Candidate y is so much better. Coincidentally, I agreed with the opinions expressed, but I'm removing the blog from my list on principle. The store has been updated! Yay! 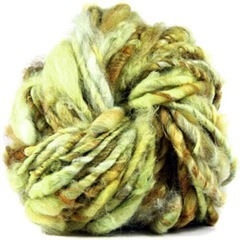 10 new handspuns, 9 new batts, and lowered prices on lots of older items. Last week's trip to Dallas was fun; I got to see my old coworkers and customers, though not as many as I would have liked to. But man, I really forgot how long that drive was. My bad back was acting up as usual, and the drive home was quite literally a pain in my backside. With me hobbling around and Adam dealing with the bug he caught from a coworker, this weekend was one big mope-fest.